Want to catch carp in the winter? Then this is the rig you’re going to need. 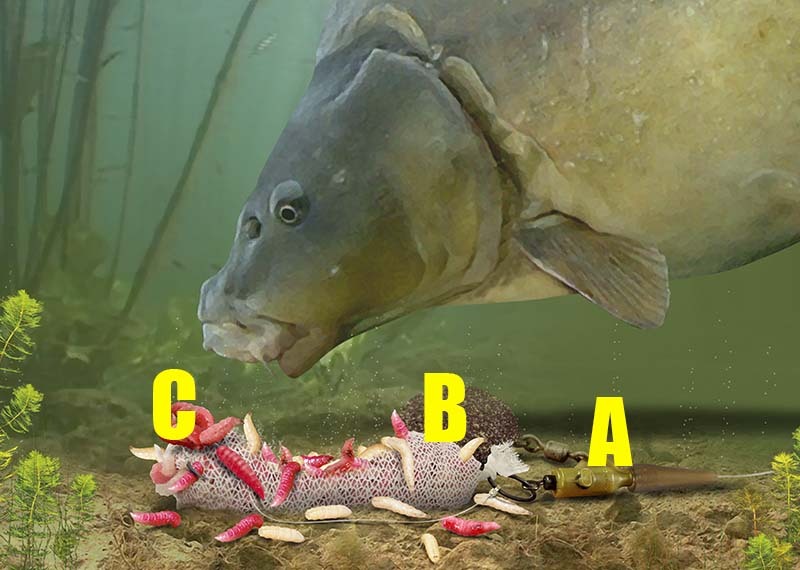 With the carp having a reduced metabolism and appetite, now is not the time to pile in mountains of boilies, yet a carefully presented pile of ‘wrigglers’ can soon get your bobbins dancing. As far as maggot rigs go, the mag aligner really does takes some beating. By using a large PVA mesh bag of maggots tied to a big rig ring by the lead, the mag aligner is virtually tangle-proof on the cast. Use a lead clip rig or a helicopter set-up. Leave a tag end on the PVA bag knot and tie it to a large rig ring. Nick the hook into the bag before casting to help prevent tangles. 1) Pierce the underside of the fat end of a fake maggot with a baiting needle and run it along the base until it exits the pointed end. 2) Tie a hook on to the end of your hooklink using a grinner knot. Grab the hooklink with the baiting needle and thread on the fake maggot. 3) When complete it should look like this. The hooklink should exit the maggot from the underside. This helps the hook to flip over.